2013 Road Trip Photos #26: the House That Vitameatavegamin Built « Midlife Crisis Crossover! We spent the late afternoon some 220 miles westward in Jamestown, birthplace of a certain funny redhead that brightened your grandparents’ lives. She used to be in all the papers. The centerpiece of Lucy tourism is kept downtown in a dual storefront. 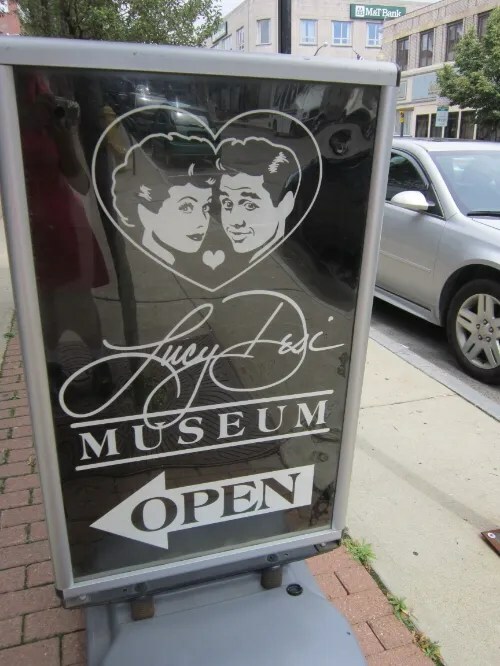 One half recalls the production company Lucy created with her first husband, actor/musician/bandleader Desi Arnaz..
…and the other half of that storefront is the Lucy Desi Museum, devoted to souvenirs from the lives of TV’s original wacky couple, Lucille Ball and Desi Arnaz. Inside these walls lies a veritable cavalcade of whimsy and wonder and all the Lucy gift-shop merchandise you can carry home in your long, long trailer. 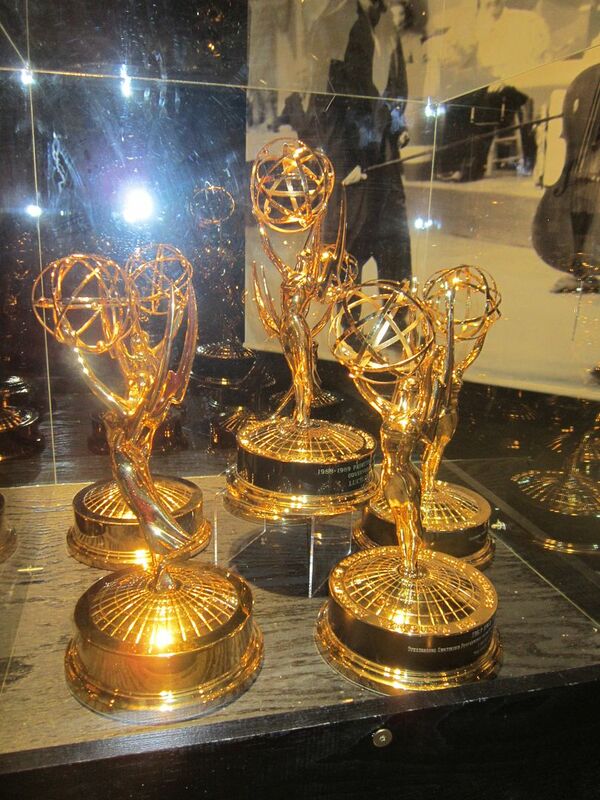 Among the shiniest exhibit pieces inside: some of the family Emmys. These aren’t the complete collection — we’ve seen a few more on display in Chicago. Several cases are devoted to Lucy’s distinctive fashion choices. 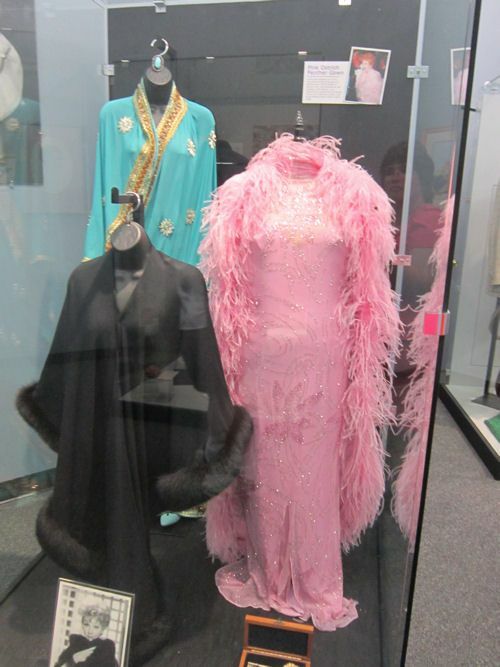 The samples from Desi’s closet are drawn from his later years rather than his prime Cuban-bandleader days. 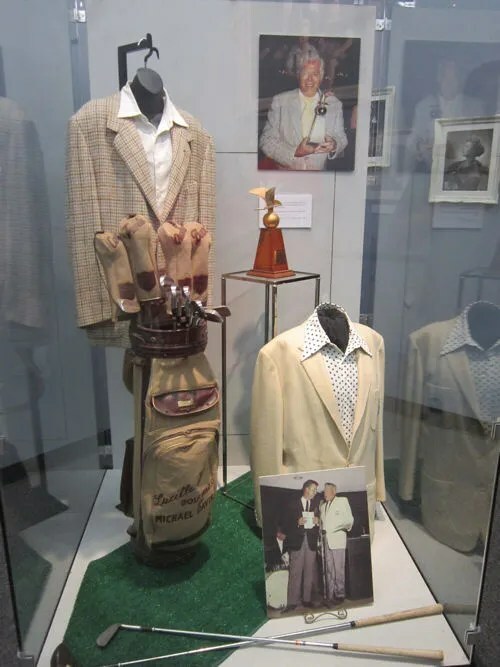 Plenty of golfing couture, then. 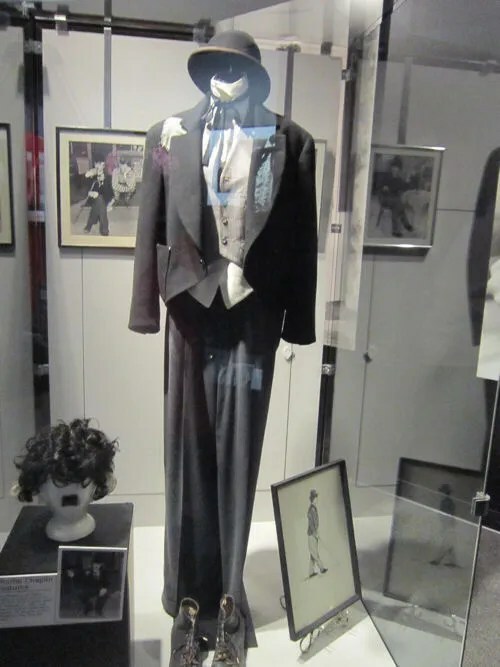 For something a little more episode-specific, behold Lucy’s Charlie Chaplin costume from the I Love Lucy episode “New Year’s Fling”. I forgot to write down what this was, and can’t recall specifics. All I know is this won the award for Spookiest Artifact. 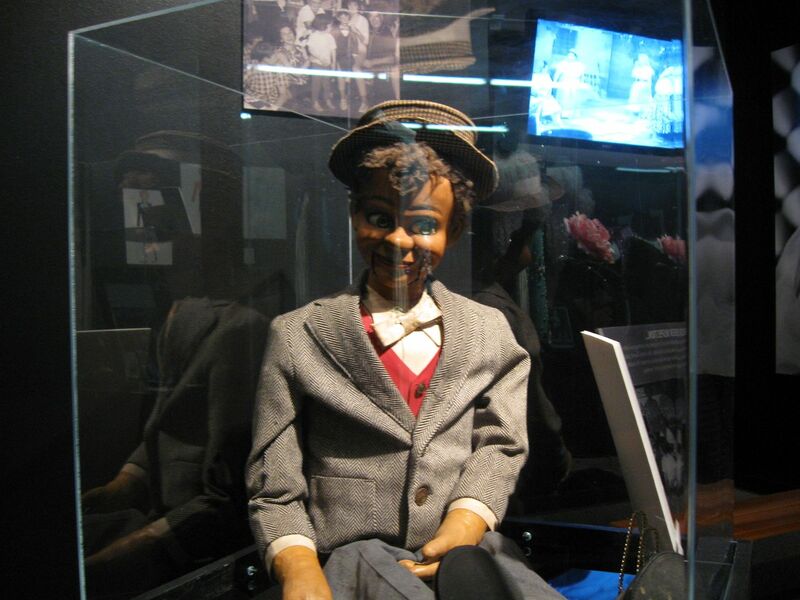 Perhaps this was on loan from one of the Twilight Zone-related attractions out east in Binghamton. 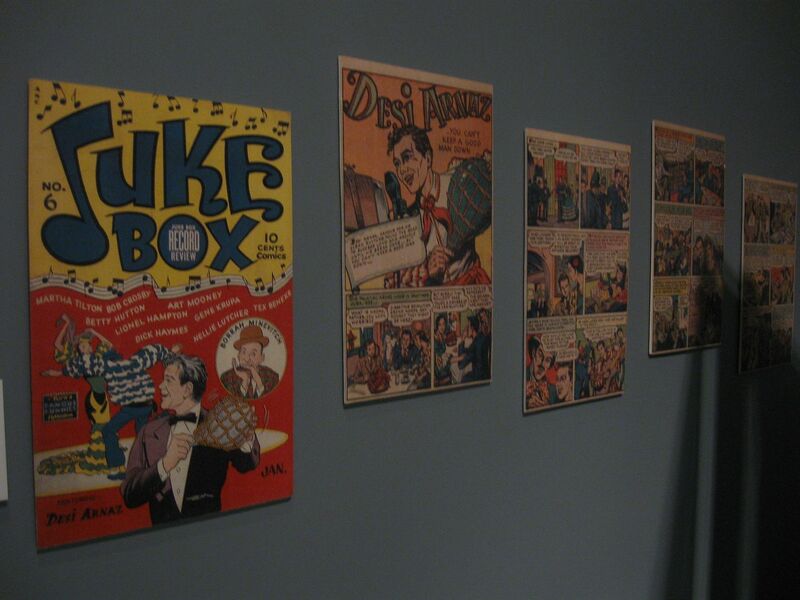 For comic book fans like me: oversized reprints of select pages from Juke Box Comics #6 (January 1949), guest-starring Desi Arnaz. Alas, this was the final issue of the series. Later in life Ms. Ball endorsed a lot of merchandise, including several board games. 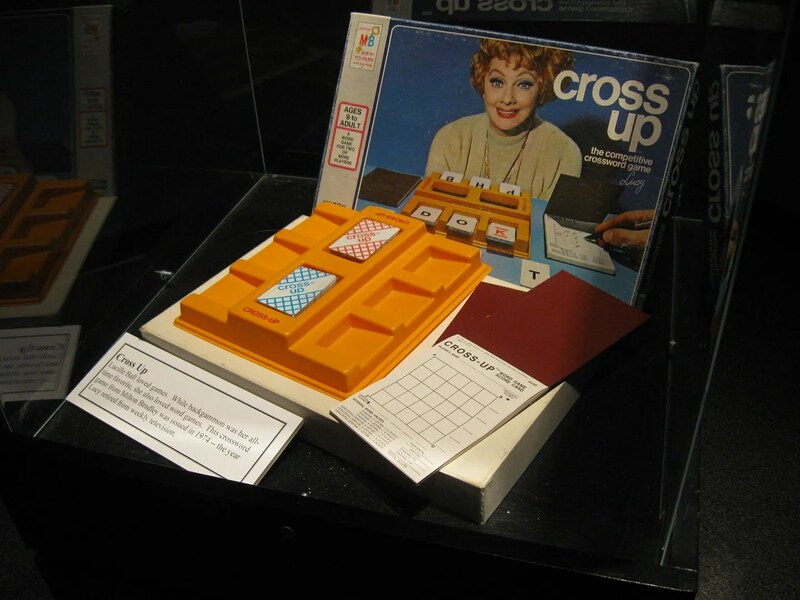 “Cross Up” was one of a few examples. Mounted in the wall above was a TV playing vintage commercials for these lost treasures, none of which apparently ever caught on. 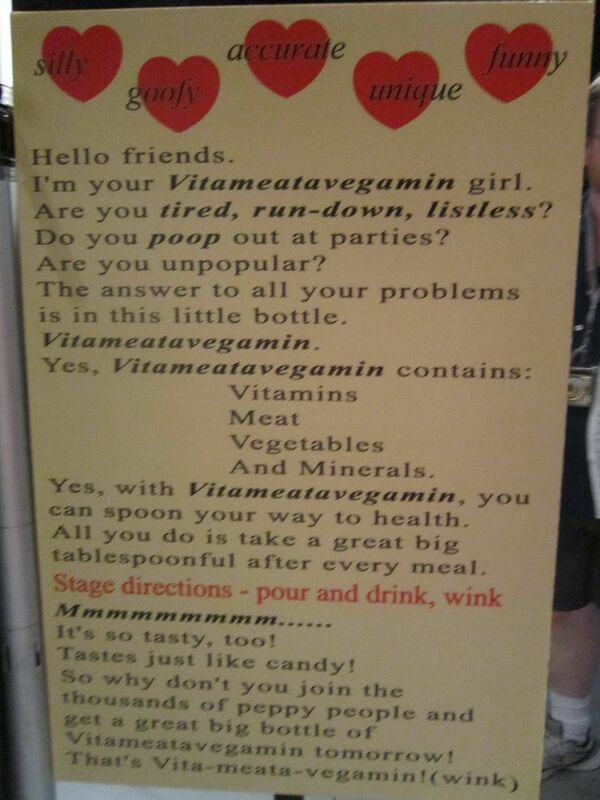 One contribution from her oeuvre that’s endured: the classic episode prophetically titled “Lucy Does a TV Commercial”, featuring the legendary elixir called Vitameatavegamin. If you’ve never seen the episode, it’s a masterwork of timing, slapstick, and verbal degradation. 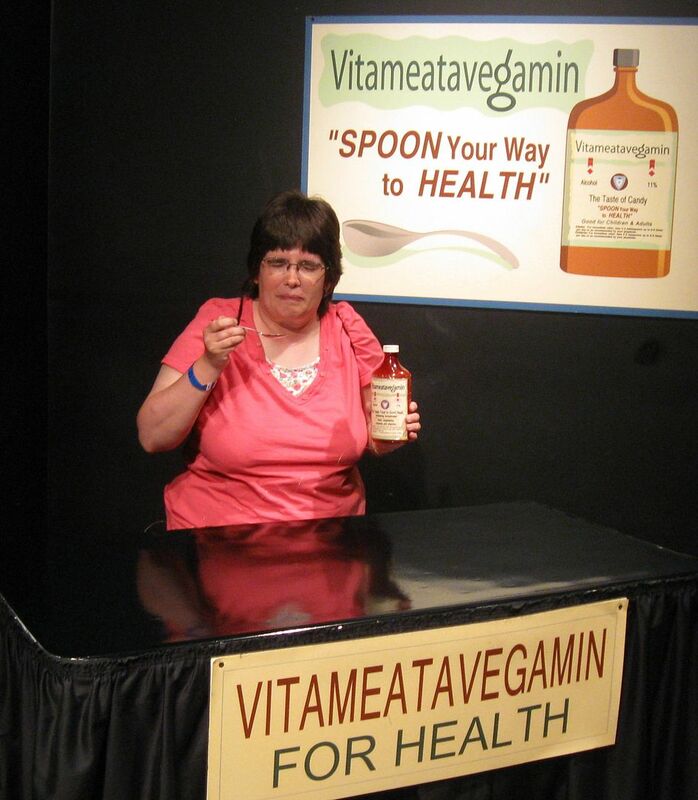 In one corner of the museum is a makeshift set where you can stand behind a table, read the world’s largest cue card, and conduct your own Vitameatavegamin rehearsal — sober, drunk, stoned, in Pig Latin, with an insultingly stereotyped accent, or whatever. You, too, can pretend to be an integral part of TV history! 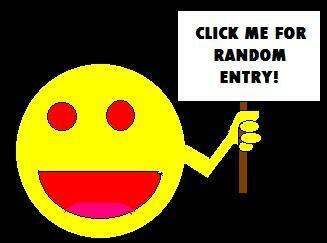 My wife’s audition. Nailed it.